Things I liked: Bright and clear optics, A/O, comparable to scopes costing much more. After about 200 rounds mounted on an RWS 52, holding zero perfectly. Positive clicks. Love the locking turrets-no messing with caps. The mil dots can be used for ballistic range compensation as well. You can't beat the price, as it comes with robust rings and flip-up lens covers. So far, an excellent value for the money. This gun has broken many scopes in the past, so time will tell. What others should know: Some items made in China are actually of good quality. This appears to be one of them. What others should know: Not the best scope but not bad for the cost. Things I liked: The scope is clear and even though the cross hairs are a little thick, they are just right for off-hand shooting and hunting in low light. The TF2 turrets are great because I don't have to remove a cap to make any elevation or windage adjustments. For the money, this is a pretty good scope. 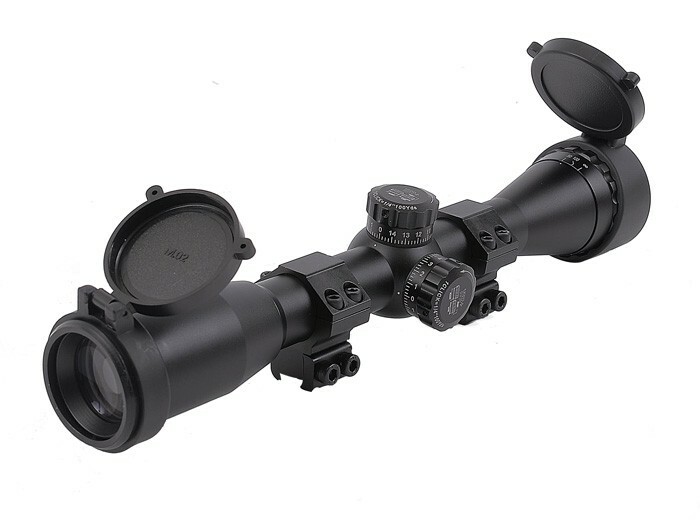 It has the limitation of not being a true mil-dot scope and you will have to adjust accordingly. However that doesn't detract from this scope from helping you put your pellets on target as long as you do the mil-dot math and make your adjustments accordingly. Things I would have changed: Get rid of the lens covers. They are no good because of the need to change the parallax setting for the objective lens. The cover is also no good for the ocular lens because of the need to focus the cross hairs for the individual shooter. So by getting rid of the lens covers, this should help bring the cost down a little. The spacing between mil-dots is not at true one mil displacement. The value between each mil-dot is three mils, not one. What others should know: The rifle that I put this scope on is the RWS Diana Mauser K98 in .177 caliber. I discovered that the displacement between each mil-dot is three mils instead of one while at the range. With that said, I had to redo the mil-dot math. The first mil-dot was worth three mils instead of one. According to the JBM ballistics for the Crosman Premier Hollow Point pellet moving at 989.9 FPS the drop of three mils puts the pellet on target at 78 yards. The first dot is good for 78 yards. The second mil-dot is worth six mils instead of two. That puts the CPHP pellet on target at 106 yards for the 2nd dot. After sighting the rifle and scope in at 30 yards, I set a soup can up at the 75 yard line and was able to hit it about 75% of the time! After shooting at that can, I put another one on the 100 yard line. Believe it or not, I was able to hit that can about 75% of the time with a $65 scope and cheap pellets. This isn't a true mil-dot scope but for the money will do the job. Thank you for a thorough and honest review. Based on your review and others here I will be purchasing this tomorrow! Things I liked: ease of use, clear glass and well built. I bought this to replace the scope that came with the >25 cal Hatsan TH break barrel. The supplied scope could not handle the force of fire. What others should know: Enjoy, great shooter. Things I liked: WELL MADE, VERY GOOD OPTICS, LOOKS GOOD ON MY RIFLE - GREAT VALUE. Things I would have changed: KEEPING THE PRICE IN MIND IT NEEDS NO CHANGES. What others should know: READ THE INSTRUCTIONS THOROUGHLY TO GET THE BEST PERFORMANCE.